Few individuals have sparked the imagination of this writer like the life of The Rev. 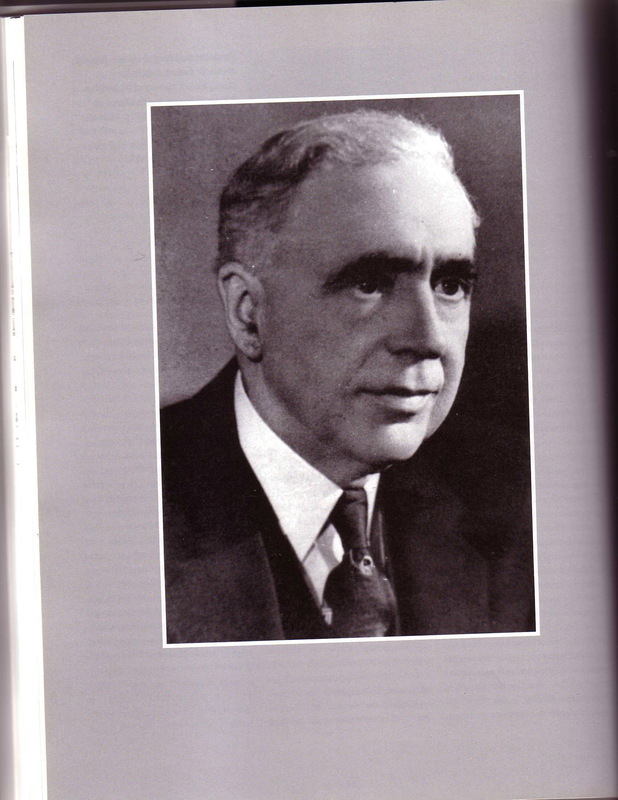 Dr. McLeod Milligan Pearce, former President of Geneva College, Beaver Falls, PA. When I first encountered his name in the 1939 Who’s Who in Pennsylvania, and learned that he was born in Bellevue, a North Pittsburgh suburb only a few miles from our family’s Pine Creek settlement, I was certain that we must be related. And who wouldn’t want to be related to this quality person? Yet, my investigation took several years and cost me several trips to various libraries, countless phone calls to Geneva College, and many unanswered e-mails to his former churches. If Dr. Pearce had been a famous athlete or entertainer, I’m certain that my job would have been much easier. But, the facts of his life seemed to be just out of reach: he had died the year I was born, his biographical references were very short and repetitive, and the sources that held the details were just beyond a casual drive. Even as I wrote the first draft of this article, having put it off as long as I could with a personal deadline of finishing the draft phase of the “E-Gen: Pearce” project ahead of me, I had barely enough information to fill one page. Being a college instructor, I found that when I finally had time to research and write, my colleagues at Geneva were also unavailable through the usual college channels. So, like a suspense novel, the particulars of this story continued to be illusive even as I wrote. Who was this man? What did he accomplish? Are we related? Let’s begin with the final question first. McLeod Milligan Pearce was born on July 16, 1874 to William and Margaret McKinney Pearce. One needs a scorecard to decipher the 1911 Austen-Pearce Genealogy sometimes, but over on page 8, Great-great grandmother Susan Austen marries Richard Pearce . Their oldest child Ambrose (1814-74), my great-great uncle, born in England and named after his grandfather, married Jane Kidd (d. 1890), and their third child is listed in the Genealogy as William “Jr.” (1842 – ) . This is a mystery because I can find no other Williams before this on the Pearce side. Perhaps his Grandfather Richard had a brother named William. As of now we are only aware of Richard’s twin sister Sarah, who married Charles Austen, Susan’s brother the same day in 1813 in a double ceremony in London [see earlier articles]. However, William, Jr.’s Grandfather Ambrose had a brother William, who would have been a great-uncle [more coming in a future article on the Austens]. But getting back to our story, Uncle Ambrose, Jr.’s son William, my cousin, married Maggie McKinney in 1867, and they named their fifth child, of six, McLeod Milligan Pearce . One of the reasons I missed this earlier was because the 1911 Genealogy lists him simply as “M.M” on page 9. Perhaps the family historians simply couldn’t spell his unusual names, but we found out from college sources that “M.M.” was the popular nick-name used by all his family and colleagues. So, we’re certain that this is the college president, and therefore distant cousin, we had been looking for all these years. McLeod’s mother, Maggie, may have been the daughter of William and Matilda McKinney, who settled in Pine Township in 1827. They had purchased 120 acres of land for $6,000 from Richard Pearce, Jr. in Pine Township, now Allegheny County’s North Park. That William (1802-75) was a farmer, a butcher, and a tanner by profession. The McKinneys, ancestors of Martin McKinney, the Chairman of Pine Township’s Historical Committee, like the Pearces, had a road named after them that passes through North Park adjacent to the former Pearce property. McLeod Milligan Pearce attended the Reformed Presbyterian Geneva College, not far down the Ohio River from Pittsburgh in Beaver County, and graduated with a Bachelor of Arts (BA) in 1896. He may have been the first one in our Pearce family to go to college. Geneva College was founded in 1848 in Northwood, a suburb of Toledo in the northwest corner of Ohio, but a recommendation by the Synod that it move closer to the heart of Presbyterianism in Pittsburgh, along with a promise of land from the Harmony Society and $20,000 from the citizens of Beaver Falls, offered a chance for growth. Our English Reformed Pearces had had associations with the German Pietist Mennonites, successors to the old Harmonnites, at least 15 years earlier when Alfred and John, McLeod’s great uncles, had purchased valuable real estate, including the original woolen mill in nearby Harmony, PA (Butler County) [see “The Pearce Blanket: Part I]. 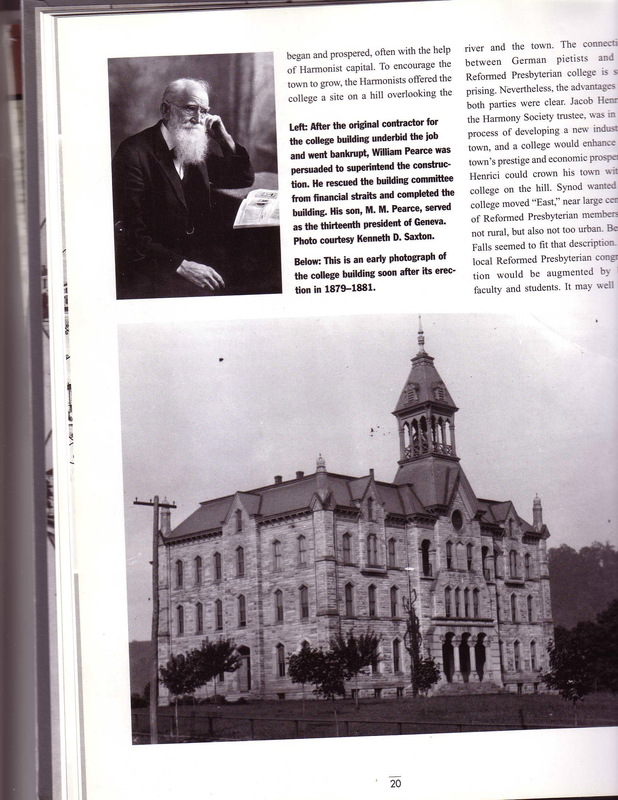 According to the college’s sesquicentennial publication, Beaver Falls became a “microcosm of the nationwide post-[Civil] War industrial growth. Many small plants, chiefly in metal-working and clay, began and prospered, often with the help of Harmonist capital” (Carson 20). While the cooperation between Presbyterians and German Pietists may seem unusual, the benefits to both parties were great. The college would “enhance the town’s prestige and economic prosperity.” Geneva’s Beaver Falls “campus on the hill” opened in 1880 with 40 students. In another irony, the original contractor for the college’s regal four-story centerpiece underbid the job and went bankrupt. McLeod’s father William, a successful building contractor and entrepreneur, stepped in as superintendent, “rescued” the building committee, and finished the project [see photos]. Remember that this all took place before McLeod even entered elementary school and 17 years before he graduated from Geneva. In the language of the Old Testament prophets, McLeod believed that he was “called by God” into the ministry. He attended Allegheny Seminary on Pittsburgh’s North Side (now called Pittsburgh Theological Seminary and moved to Pittsburgh’s East Liberty/Shadyside section) and was ordained. He married Carolyn Belle McKaig and served a large congregation in Pittsburgh’s East End. Later he became Senior Pastor at First Presbyterian Churches in St. Louis and Philadelphia. He was awarded an honorary Doctor of Divinity degree from Geneva in 1915, surely the first one in our Pearce family to be so honored. In the spring of 1948, President McLeod Milligan Pearce, The Rev. Dr. or “M.M.” to his friends and family, presided over centennial festivities that included a luncheon with the governor of Pennsylvania, James Duff. The president of Evansville College, Lincoln B. Hale, and representatives from many colleges, including Harvard, Yale, and Princeton, offered their congratulations. Through commencement, the welcoming of a new freshmen class, and or course another football season, the campus was joyful and positive. But, just before Thanksgiving that year, the atmosphere on campus darkened in an instant. On November 22, the day that most Americans have come to associate with the assassination of President John F. Kennedy, McLeod Milligan Pearce died from complications of a heart attack suffered a little over a week earlier. He was only 74 years old, young by the standards of his ancestors [see earlier articles]. David Carson, in his publication Pro Christo et Patria: A History of Geneva College, characterizes the mood on campus as “stunned” (93). He reports, “The thirteenth president’s administration had spanned a quarter of Geneva’s century, through depression, war, and peace. Most of the college family had known no other president. God had graciously allowed him before his death both to celebrate Geneva’s past and to see the bright prospects for its future” (93). (Associated Press – Dateline Beaver Falls, PA) Dr. McLeod Milligan Pearce, President of Geneva College for more than a quarter century, died unexpectedly today in Providence Hospital at the age of 74. An ordained Reformed Presbyterian minister, Dr. Pearce had been in the hospital since November 13 after suffering a heart attack. The College dedicated a new two-story dormitory in honor of Dr. Pearce in 1961 to house the increasing resident population. In 1964 an additional floor was added as per the architect’s plans. A good friend and graduate of Geneva, The Rev. James R. Farrer, when asked about his undergraduate years in Beaver Falls, remembered only positive references to Dr. M. M. Pearce: a portrait of a kindly-looking gentleman in the administration building and a dormitory with the name “Pearce” in bold letters near the entrance. Having never met the man, two things come to mind for me: who wouldn’t remember anyone with three last names [studies have been done on the necessity of such in being a college president in America], and anyone who was president of anything for 25 years ought to be remembered. So, after several years of painstaking, yet incomplete, research, I’m proud to say that I’m related to The Rev. Dr. McLeod Milligan Pearce, famous American college president. Stay tuned for additional information. Carson, David M. Pro Christo et Patria: A History of Geneva College. Beaver Falls, PA: The Donning Company Publishers,1997. Obituaries. New York Times. November 23, 1948. Who’s Who in Pennsylvania. 1939.